The Parry Endeavour was a 14m foam sandwich construction sloop originally designed by Phil Curran in 1978 as the yacht Challenger. 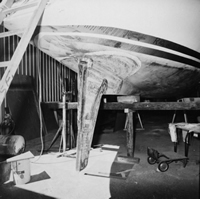 Local boatbuilders including shipwright Des Piesse, in conjunction with CMST, embarked on a major refit program from early 1985 with the aim of minimising the likelihood of structural or equipment failure during the voyage. 6 The CMST's naval architect, Kim Klaka, provided design advice for the refit of the which included the strengthening of the hull and the construction of a new keel and a shortened mast. As Kim Klaka relates, substantial changes were required to ensure the yacht could sail for two years without stopping for repairs or provisions. 'The hull [was] strengthened with a matrix of additional internal stiffening, linking hull, deck and major stress areas. Watertight bulkheads were fitted fore and aft, other bulkheads being strengthened considerably. A new fin keel was cast of 5.08 tonnes with a VCG above root of 0.66m (previously 4.25 tonnes, 0.84m VCG) suitably designed to generate less bending moment at the root (3.35 tonne.m as opposed to 3.56 tonne.m). The rudder stock was rebuilt and the skeg deepened by 300mm to improve rudder strength (bottom pintle added) and increase directional stability. A heavier section mast (250mm x 175mm) some 2m shorter than the original rig was chosen from the Rolly Tasker Spars range. The mast is deck stepped, unusual for an ocean voyaging yacht: this is a characteristic of almost all Perth based yachts as they must 'shoot' the Fremantle bridges to reach the Indian Ocean. Consequently the local spar manufacturers are expert at deck stepped tabernacle systems. 'The standing rigging (stainless) was increased to 7/16 in diameter uniformly for ease of repair and cannibalising. At Jon's request, every stay was backed up in some manner, resulting in twin forestays, double inner forestays, twin cap shrouds, twin intermediates, in-line and aft lowers, three backstays and a pair of runners for good measure. No calculations or load predictions could justify this configuration but events during the voyage have shown that experience and intuition can still lead science and engineering. The two obvious problems with such a rig are the nightmare of tuning and the increased compression loading under the deck. The former was left in the capable hands of Jon whilst the compression was taken by a further two support posts underdeck. 'A major upgrade of the electrical system was carried out by Tim Pauly of CMST. The yacht is equipped with an arsenal of electrics, including 4 Codan HF radios, 2 AWA Pilotphone VHFs, Magnavox MX4102 satnav, tv, video, 2 Argos tracking transmitters and a specialised 12kHz Raytheon depth sounder capable of recording to 6 km. All systems are 12 volts (except the 24V Argos) supplied by eight 75 Ah (@ 20hrs) batteries. The Argos transmitter also has 45 days internal lithium cells for emergency use. Charging is from two systems: 4 x 50A alternators driven by the twin 18 hp Volvo auxiliaries and 5 Solarex LX100GT (956mm x 456 mm) solar panels of nominal current 2.75 amps (36 cells/panel, 42W peak power). 'The yacht is equipped with 3.5 tonnes of stores, including 16 sails, 100 video tapes, 450 litres of diesel and 500 litres of fresh water - rainwater is collected by a canvas bucket slung under the main boom.